Sweet Sweet Canyon is the third race track of the Mushroom Cup in Mario Kart 8 and Mario Kart 8 Deluxe. Similar to Cookie Land from Mario Kart: Double Dash!! and Tart Top from Mario Kart DS, this course takes place in the land filled with pastry confections and desserts, such as cakes, cookies (including Yoshi Cookies), ice creams, candies, donuts, macarons, chocolates and so forth. Gingerbread Toads can be seen cheering at the start/finish line. There are twenty-five Coins located on this track. The course starts out in the place where Gingerbread Cookie characters are watching, while Yoshis are situated on the other side, apparently cheering for racers. 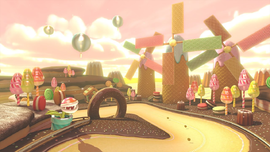 In front of the place where such characters are cheering, the track enters a cave made out of cookies, followed by a glider cannon that launches the racers onto a cake tower with soda waterfall. Along the way lies the pylons made out of ice cream cones, and racers will be driving inside yellow water made out of soda. After the soda section, racers can either choose a blue path or a pink path, both of which are anti-gravity routes. After the anti-gravity paths meet up again, drivers will encounters a number of Pink Piranha Plants, hiding inside green Pipes. After a few turns, players hit a drop-off before hitting the start-finish line. If one uses a Mushroom, it is possible to drive through the chocolate donut and cut off the turn before the drop. On the Blue anti-gravity route, players can fall off the track at the chocolate part, and land on the pink anti-gravity route. This shortcut is best done with a Mushroom. The staff ghost for this track is Baby Peach on the Teddy Buggy, with a time of 2:12.107. In Mario Kart 8 Deluxe 200cc, the staff ghost is Peach with a time of 1:40.972. One of the Yoshis near the starting line occasionally hums Totaka's Song. This also occurs in other courses featuring Yoshis in the audience (SNES Donut Plains 3, N64 Yoshi Valley, GCN Yoshi Circuit, GCN Baby Park, and Super Bell Subway). This track can be seen on some of the posters for Galaxy Air. This page was last edited on April 6, 2019, at 21:42.